BROWNSBURG, Ind. 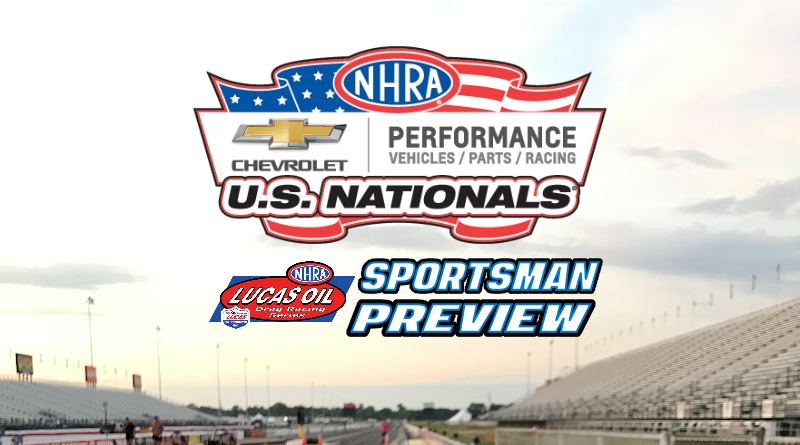 – The 64th annual Chevrolet Performance U.S. Nationals, 18th of 24 events in the NHRA Mello Yello Drag Racing Series starts Wednesday as more than 600 of the nation’s best sportsman racers compete for the coveted U.S. Nationals title. Racer’s trying to add their name to the history books are forced to deal with a marathon week in Indianapolis as the event, the longest on the NHRA tour, stretches over six days. In addition, racers typically hit the track only once or twice in a 24 hour period forcing them to “get focused” on a moments notice but then remain calm for extended periods between runs. To add to the prestige, the long week, tons of down time, and tough competition, competitors have to deal with the pressure that increases with every win light. The closer racer’s get to the “Big Show” on Monday, the more intense the pressure gets. Having been in competition on Monday afternoon at Indy, I can tell you everybody’s nervous, whether it’s their first time or they are a seasoned veteran, everyone wants to win Indy and the pressure is intense. DragChamp will be providing daily updates throughout the week to keep everyone up to date on the racing action. In today’s preview, we’ll provide an overview of each class along with our predictions for each class. Wednesday is scheduled for two rounds of qualifying for Stock, Super Stock, and the Hemi Shootout, along with two rounds of time trials for Super Comp and Super Gas. Thursday calls for another round of qualifying for Stock, Super Stock, and the Hemi Shootout followed by class eliminations for the Stockers. Super Comp and Super Gas get two more time trials before Super Comp goes into race mode for round one of eliminations. Friday’s schedule kicks off with Super Stock class eliminations along with the Hemi Shootout eliminations. Two rounds of Super Comp and Super Gas eliminations round out the day. Saturday kicks off Stock Eliminator eliminations while Super Comp and Super Gas are scheduled for round four of eliminations. Sunday is Super Stock eliminations time as the Super Stockers kick off the day with round 1. Super Stock, Stock, Super Comp, and Super Gas will run through round five by the end of the day. The Factory Stock Showdown gets down to business with round one of eliminations. Monday, the “Big Show”, includes the semifinal and final rounds of all of the sportsman classes as the event wraps up. With 175 Super Stockers in attendance, it’s going to take a huge effort just to qualify for the 125-car field. Last year’s winner Kevin Helms will not be a repeat winner this year as he’s not entered in the event. Kevin will be busy this weekend keeping the DSR Dodge Challenger’s running as he is now the crew chief for driver’s Leah Prichett and Mark “Cowboy” Pawuk in the Factory Stock Showdown class. David Rampy will be looking to find two more win lights this year than he did in his semifinal appearance last year. Rampy, No. 3 in the world last year, is always a favorite to win Indy. Jimmy DeFrank – The California runner is always a tough out, proven by his multiple world championships. Jacob Pitt – The Texas racer consistently goes deep and has a knack for turning on win lights. Gary Stinnett – The Kansas racer kicked off his career with a Super Comp win at Indy in the early 90’s. He’d love to do it again in Super Stock. Ray Skillman – The crowd would go crazy if local racer Skillman took home the Wally. Jeff Strickland – The former Stock Eliminator world champion knows how to get it done. Like Super Stock, there will be a ton of Stockers on the grounds this week, 172 to be exact. The first race is just to qualify as about 50 racers will never see round one of eliminations. One racer that is excited to come back is defending champion Larry Gilley. The California racer made the long tow worthwhile last year by winning in dramatic fashion, he won a heads up E/SA dual in the final by just .007-second, over Darrel Steiger. Last year’s semifinalist, Dan Fletcher, will be looking to go all the way this year. Jeff Taylor – The former multi-time world champion has been killing it this year, no reason to believe that will change this weekend. Brad Plourd – He won Indy last year in Comp driving a funny car (less the body), he’s always a threat when attends a race. Randi Lyn Shipp – She’s been super hot all year, made it to the finals at the last two national events, she could make it three in a row at Indy. Lee Zane – Another former world champion who can win in anything. Jeff Lopez – The former Indy champ was super hot earlier in the year at the D4 points races, could earn a second U.S. Nationals Wally this week. With 123 competitors, Super Comp is sure to be a dogfight as everyone has good equipment in this class. Driving experience plays a huge role in Super Comp at Indy since the race plays out over a longer period of time making it more difficult to keep your car dialed to the index. Last year proved this as Ray Connelly defeated “The King” Edmond Richardson in the final. Those two guys know a thing or two about driving a Super Comp dragster. Edmond Richardson – Shocker right, Edmond got close last year and will be hungry to finish it off this year. Christopher Dodd – The young Texas racer has a habit of laying down great runs and the pressure doesn’t seem to bother him. Devin Isenhower – Another young racer that could take his place on the big stage this weekend. Austin McClure – This Kansas runner is having a great season, a win at Indy could be in the cards. Val Torres Jr. – The California native always finds his way to the late rounds. With 119 competitors, Super Gas will be much like Super Comp, tough. With all of the racers using practically the same technology, the racing just gets closer and closer as the packages get smaller. Super Gas typically comes down to who screws it up the least as it’s usually the driver’s fault for most losses. Kevin Adams, last year’s winner, and Samantha Coughlin, last year’s runner-up, look to be skipping the Big Go this year after great efforts last year. Racers that made great runs last year like Jacob Elrod and Jackson Collier will be returning to take another shot at Indy. Kevin Moore – A bad dude from D5 that doesn’t travel much although he kills it every time he shows up. Luke Bogacki – My bud Luke is as good as it gets, Indy gets him excited and that’s dangerous for the rest of the field. Michelle Furr – She made several finals early in the year, could ignite the back-end of the year with a win at Indy. Tommy Phillips – This guy is unbelievably talented, always a threat to win as he did a couple of years ago at Indy. Devin Isenhower – Young racer that knows this track, he should be a tough out this weekend. This class has taken over Indy as everywhere you look this week you’ll see Factory Stock cars. They’re fast, fun to watch, the spin the tires, and look just like a car you drive down the highway, what’s not to like right? This class has taken some prestige from the Hemi cars and rightfully so, they run super fast on little tires. In last year’s final David Barton defeated Steven Bell to claim the prestigious title. This year it may be a little more difficult as the class has tightened up significantly this year. With Barton, the Stanfield group, Joe Welch, the DSR cars all running strong, this class is beginning to look like Pro Stock from the not so distant past. Aaron Stanfield – This young racer steps up bigtime on the biggest stage, this week ranks high on the big stage list. Mark Pawuk – The “Cowboy” has adapted quickly to the class, with a strong car, this could be a great story this week. Joseph Welch – Back-to-back winner earlier this year could spell trouble for the rest of the field at Indy. With a large field of 30 cars entered this week, competition should be high. This is a large field of Hemi’s and it goes to show that heads-up racing is still popular and these Dodge’s haven’t lost their appeal. This is a fun class to watch and although some of their mojo has been stolen by the FSS cars, these classic muscle cars are fun to watch. After winning the Shootout last year over Wendall Howes, Jim Daniels has to be the favorite once again. Daniels has a fast car and drives the wheels off that thing. He’s my pick to go back-to-back this year. And just like that, racing will begin at 8.30AM. Welcome to Indy!